Is that Boring Asphalt Shingle Roof Costing You Thousands? Did you know that a green roof can extend the lifespan of your home’s roof surface by two to three times? Did you know that a green roof – even the most basic kind – can save you up to 30% on heating and cooling costs? Did you know that a green roof can cost as little as $8 more per square foot than a conventional roof? Did you know that some green roofs require no additional irrigation, and can run nearly on autopilot year-round? Building incentives and tax breaks for putting in green roofs aresprouting up all around the U.S. and Europe. And there is now a multitude of custom products like filter fleeces, root barriers and drainage layers that take the guesswork out of building a green roof. Washington, DC offers a subsidy of $5 per square foot (up to $20,000) for installing a green roof. Fairfax, VA allows property owners to use green roofing to increase the amount of land they can pave or build on. I know, the terminology around green roofs can be confusing to say the least. In fact, even the green roof “gurus” can’t agree among themselves about the definitions of some green roofing terms! But that’s why I’ve spent the last year working on a project that will help you get started creating your own green roof quickly and easily. No technical experience required: This book is designed for homeowners who are not necessarily the “do it yourself” type, but who want to arm themselves with information as they go into discussions with green roof service providers. 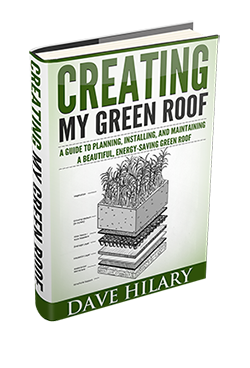 Save time and money: This book is jam packed with tips from interviews with professional contractors and engineers to help you quickly get up to speed on all aspects of green roof planning, creation and maintenance. Does this eBook contain actual blueprints for a green roof? No. 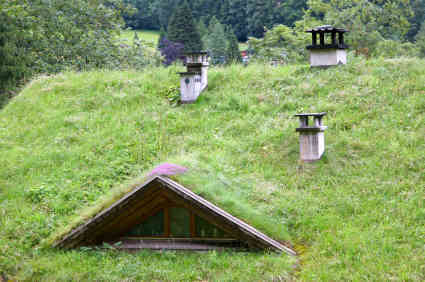 Unlike a shed or chicken coop, every green roof project is unique, and defined by of the underlying structure, local environment and – of course – the creativity of the installers. That’s why I thought it would be much more useful to provide general information that will help homeowners plan, build and maintain a unique, custom green roof. But what if I’m not the handyman type? This book was written with you in mind. There is plenty of specialist info out there for those who already have a good handle on the basics of green roofs, but next to nothing for the beginners among us. I wrote this eBook to help solve this problem, and hopefully, inspire the next generation of green roofers among us to embark on their own projects.